Nominated by her colleague Alycia Nygard, RN, BSN, Clinical Head Nurse, Pediatric Hematology/Oncology, Penn State Hershey Children’s Hospital, Ms Antolino-Smith is also a Clinical Ladder IV nurse with a wide scope of responsibility in her unit, and is in the Integrated Council, where she helps implement necessary changes in her practice. Ms Antolino-Smith is also a core charge nurse who organizes assignments for the nursing staff, and troubleshoots issues that arise. When making the nomination, Ms Nygard cited Ms Antolino-Smith’s role as a leader and a mentor. Following is an interview with Ms Antolino-Smith. Q: How long have you been a nurse, and what path brought you to your current position? Barbara Antolino-Smith (BAS): I have been a nurse for 20 years. I first had a degree in history, which is one of my favorite subjects. I started volunteering at a hospital caring for newborns, and I loved it. I set up a parents group and organized volunteers. I was age 41 when I finally received my nursing degree, and I had my fourth child in the middle of it. That presented some delay, but I knew what I wanted to do; I wanted to work in pediatrics, and I wanted to work at a university hospital because I felt that would give me the best challenges. I am now a senior staff nurse. My unit takes care of children receiving neurosurgery and kidney transplants, as well as children in nephrology, hematology, and, of course, oncology, which is extremely rewarding. We care for children with cancer throughout their course of treatment and beyond. Q: What inspired you to become a nurse? BAS: I love people; that is the basis of my inspiration. I like them with their weaknesses, their crazy lives—the full gamut. I especially love children, and want to do right by them. I think I got to where I am now by being open- minded about the human condition. If nurses do that, they can provide incredible care. Q: What inspires and motivates you each day? BAS: I work with infants, toddlers, children, and teenagers. Seeing the strength that they display daily in the face of horrific diagnoses and tensions, it is so easy to do my job; I cannot help but try to do my best for them. Being in the pediatric oncology unit, I witness parents and extended families struggle with seeing what their children have to go through, so it is very easy to be motivated. I want to do whatever I can for them. Q: What role do you think nurses have in patient care? BAS: There is no question that nurses hold the master key for patient care. We feed information to the physicians and team, unlock the roadblocks to care, and tailor care to each patient’s specific needs and goals. It takes a huge amount of understanding and searching for patients’ underlying issues, but nurses are central to patient care. BAS: Presently, because I am a senior nurse and I have been involved with many committees and initiatives, mentoring our staff and guiding them through caring for patients and families with complex needs is the most rewarding. Sometimes caring for patients is not an easy ride; they sometimes display anger, inappropriate behavior, or substance abuse. I try to mentor the staff so they understand that we all come from different backgrounds and beginnings, and that our job is beyond that. Our job is to use what we know to take care of patients and families. Q: What do you feel are the benefits of being a member of AONN+? 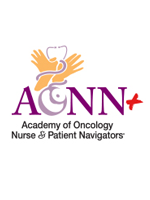 BAS: AONN+ allows nurses and nurse navigators to keep up with all the changing requirements that we are asked to adjust to. They can learn about different ways to run programs and evidence-based practices, as well as what works and what does not work. There is a huge need for nurses to use professional associations and academies like AONN+. Q: How did you feel when you learned that you were nominated for the ONE Award? How did you feel when you won? BAS: That question is easy to answer; I felt humbled. That sums it up, and that is how I felt when I won, too—just humbled. Q: To which charity will you donate your winnings? BAS: I thought about this long and hard because I have a lot of pursuits and interests. I do work with children, and there are a lot of wonderful charities, but I am going with Doctors Without Borders. Their work is not bound by arbitrary national limits. They maintain a worldview of care that is the cornerstone of my personal belief in our shared humanity. Their work is so multifaceted; they provide basic and complex medical care to all citizens of the earth. They work with countries to provide children with immunizations, and they care for patients who are caught in horrific circumstances, such as refugees in war zones. They go into dangerous areas where they are not always welcomed, and they provide excellent care. I provide high-end nursing care in my unit, which I am very proud of, but there are hundreds of thousands of otherwise healthy children in the world who die from simple diarrheal diseases or infectious agents. Doctors Without Borders is there for many of those children and their families. Q: What advice can you give to other nurses, nurse navigators, or nurse practitioners, especially those who are just starting out? BAS: This is important, because nurses have a tough job. Beginners need to find a nurse mentor to help them get through the rough spots, and to be a sound board that they trust. In addition, nurses always need to remember to respect the cultural and religious values of the patients they care for. Nurses must also be able to identify support systems, the coping skills of patients and survivors, and constraints each patient operates under. Nurse navigators do this exceptionally well. Some patients and families drive 2 to 3 hours to our facility, weekly, for 3 years, for a leukemia diagnosis. That is an incredible burden on a family. Looking at the big picture goes a long way with nurses appreciating the care that they need to provide. People view nurses as being positive, and they are. However, more importantly, nurses are realistic. They deal with the real world, and not through rose-colored glasses. That is my advice to them—do not just maintain a positive outlook, but be realistic in what may happen to the patient. Q: Is there anything else you would like to mention that we have not discussed? BAS: The richness in our lives in this country is not measured by things or by the parameters of success, such as careers, money, or houses. Richness needs to be measured in relationships, and showing kindness and patience toward others. We must live by the “golden rule.” Nurses and navigators understand that implicitly, and they are my heroes.